The saturated palette choice is striking, comicbook-esque in terms of colour and design; this feels even more the case when watching the environment get wrecked around you. Curiously, at six hours of gameplay it somehow felt too long - the final levels adding little beyond more playtime. Inconsistent difficulty, with some rooms being so frustratingly difficult they stop being fun, and then being followed by far easier set ups. Only a couple of tunes throughout. Not bad tunes, to be fair, but you will become very familiar with them. My days of serious comic collecting may be more than two decades behind me, but I can still remember how new superheroes would be set up, hoping for an audience. They needed a costume, a power-gimmick, and a catchy name that let you know what that power was… and by those criteria, “Mr Shifty” does rather work, although somehow it also feels perhaps… cute? Which is perhaps misleading, as Mr Shifty is not cute at all. The basics of gameplay have you moving from room to room, taking out the guards of Olympus Tower, “the most secure building in the world,” to retrieve some “Mega Plutonium”. It’s not the most profound of plots – though it does add a few twists as you progress – but is ultimately just a matter of explaining why you’re there in the first place. 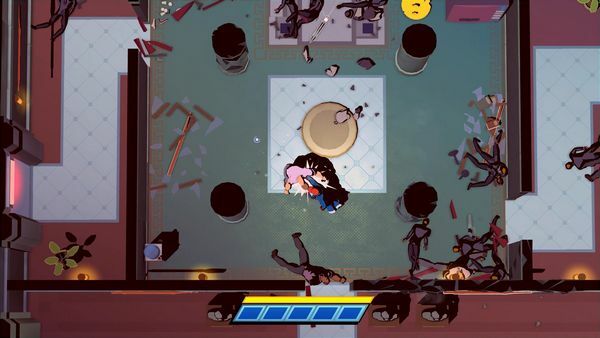 The viewpoint is directly overhead, which combined with the requirement on most levels to clear out all the guards before progressing does throw up strong comparisons to Hotline Miami. 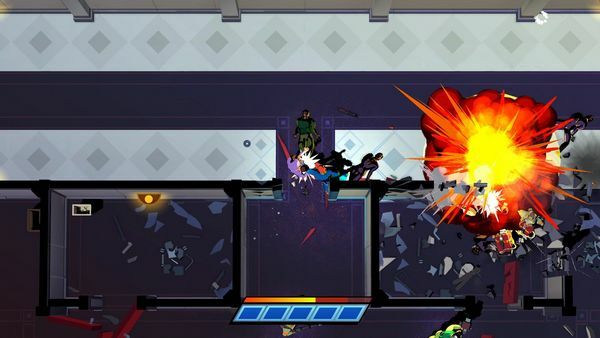 However, Mr Shifty’s name refers to his ability to teleport in small jumps, so while you won’t ever use a gun (unlike most of the guards), you also shouldn’t need one. Teleport behind guards while they’re trying to aim, or jump through walls for safety… or just dart into the middle of a group and hope the crossfire drops the numbers somewhat. Between your melee focus and ability to jump around it sounds like the setup for a stealth game, but the pace tends to speed up quickly, enemies attack in groups, and you tend to enter rooms with the subtlety of a kicked in door. Literally. Teleporting isn’t your only ability though, as you seem to be exceptionally strong – on a couple of occasions punching your way through walls – and combat also fills a special gauge that, when full, drops everything into slow motion when a bullet gets too close. If you thought teleporting made you feel powerful, wait until you see yourself run past a volley of gunfire to quickly beat down the gunmen. Your abilities feel very effective, with much thanks for that coming from seeing the environment get devastated as you fight through it – scenery shatters into kindling, walls collapsing as you punch people through them, explosions shattering pillars you want to hide behind… you have an effect on more than just the people you fight. Friendly fire means that enemies throwing grenades can be among the best allies you’ll get. As you progress through the levels, you’re introduced to a variety of new hazards, both traps and personnel. Additional types of guard join the ranks – only slow pistolmen to begin with, but by the end you’ll be dealing with beefed-up salarymen, jumpsuit-wearing machinegunners, staff wielding kunoichi, and accountants with combat shotguns… Each type of enemy provides a different hazard, and while two or three punches tends to take anyone down, you in return are working on a one-hit kill basis. That ability to teleport into position for a good takedown is also your main method of not getting killed. Though you will get killed, a lot. Each of the eighteen levels is made up of several rooms, with each room acting as a checkpoint to restart when (not if) you go down in a blaze of teleporting glory, letting you get repeated chances to attempt each section of the game. But part of the problem lies in how each room is essentially separate from every other one in a level, with difficulties rising and falling from section to section without much overall consistency. Playing all the way through took around six hours, and so the following might be an unexpected criticism, but it also felt longer than it needed to be. The core gameplay is fun, jumping from point to point and treating walls as something to surprise guards from (or punch guards through), but there hits a spot where it feels like all that is being added are more guards. Some of the later levels can involve several minutes avoiding gunfire and traps, where it only takes one mistake on your part to start again… and it crosses that point between enjoyment and frustration. It’s not bad for it, but it does feel like it runs three levels or so too long. 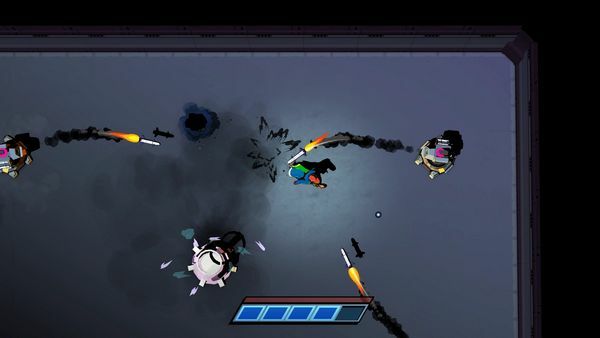 In place of the last few levels, adding extra content might have been better in some form of challenge mode, which the game would seem ideal for – between your abilities, the variety of enemies, room layouts and traps, having a way of trying short scenarios with your abilities would seem a good addition. Sadly, the game has nothing beyond the core game and a level select for stages you’ve completed, and the only motivation to play through a second time would be to attempt a better time and lower number of deaths (both recorded on finishing a level). It’s a shame. The game is largely fun, and going back to the original analogy, the saturated look with a reduced palette does look stylish and fit the comicbook atmosphere. It’s just that towards the end of the game the earlier creativity gets replaced with a “more of the same, but bigger” approach, simply throwing more enemies at you and increasing the challenge into realms of frustration when you know that the unlucky shot that just hit you means you have to begin a long grind through a room yet again. Rated 16 by PEGI; not rated by ESRB, but I’d estimate it’d get a Teen rating based on their criteria. No blood, but still with plenty of violence.